The Moredun Institute was treated to a Royal visit on Wednesday, as HRH The Princess Royal joined more 100 representatives from the livestock and agricultural industries at an event to highlight new products, technologies and creative communication tools to help improve the health and welfare of livestock both in Scotland and across the world. Presentations included a look at how smart engineering has enabled the design of a rapid pen-side diagnostic test for sheep scab, the development of new vaccines against nematode worms and parasite control and prevention of drug resistance. 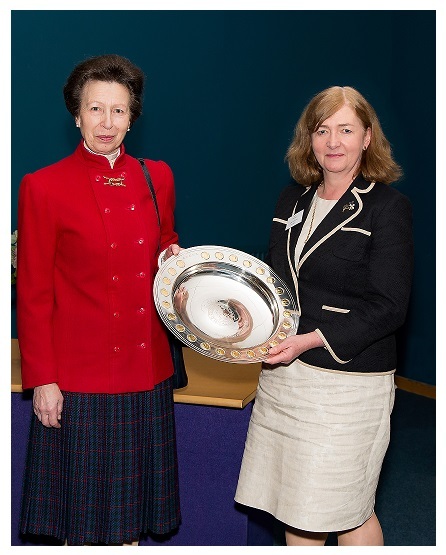 During her visit, HRH also presented the Royal Smithfield Bicentenary Trophy to Professor Julie Fitzpatrick (pictured). The Bicentenary Trophy is awarded to publicly recognise an individual’s significant contribution to the overall benefit of the British meat and livestock industry.